My daughter was born with Trisomy 13, a rare condition also known as Patau Syndrome. There are many statistics that float around the internet and between doctors regarding the incidence, but one is that it occurs 1 in 16,000 live births. Trisomy 13 is an extra copy of the 13th chromosome. We were told that there was nothing we did to cause it or could have done to prevent it. It happens in a similar way to Down Syndrome, which is an extra copy of the 21st chromosome. However, the developmental problems and birth defects are more severe with Trisomy 13. At every OB appointment, I got nervous as he searched for her heartbeat – we were told that she could pass at any time. My husband always came with me to my appointments, and when they became more frequent at the end of my pregnancy I told him he didn’t need to always come with me. He replied that he didn’t want me to be alone if my OB couldn’t find Caroline’s heartbeat. 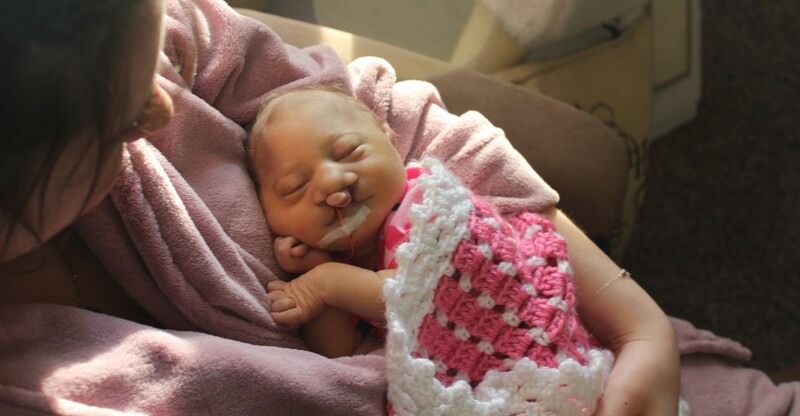 Caroline had most of the common characteristics of children with Trisomy 13; she had a severe heart defect, cleft lip and palate, and an extra pinky on each hand. Something that I believe helped her to survive as long as she did was that her brain was structurally normal, while many children with Trisomy 13 have a condition called holoprosencephaly. Despite all of her medical problems, Caroline was the sweetest, happiest child. She was comfortable and in our arms for 58 amazing days. We did everything we could to give her the best quality of life that we could while she was with us. Miss Caroline is terribly missed and I am so grateful for the time we had with her. Categories: Trisomy 13 | Tags: carrying to term, cleft lip and palate, heart defect, love, quality of life, trisomy, trisomy 13 | Permalink.